Zhou Xun: " Li Mi's Encounters" Began Shooting In Secret ? On Aug 20th, many reporters appeared near a restaurant in Kun Minh because they knew that dramatic team of "The Encounters of Li Mi" would have lunch here. About 10h30, the team came by car. As soon as seeing Zhou Xun in blue T-shirt, reporters wanted take photos of her but many security staffs stopped them. Because no one was permitted to enter the restaurant so everything happened in it is secret. While trying to get news, reporters and security staffs had slight fighting. However, a staff of the restaurant disclosed that they were shooting the scene of Li Mi and her boyfriend had a birthday party. Although this was the first time Jue and Deng Chao cooperated, they understood each other very much. 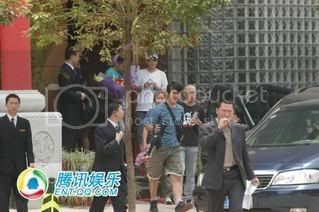 Around 1 p.m, the dramatic team left the restaurant and reporters see that they finished the first scene in secret. It was reported the movie would be shot in Kun Minh in 2 months.